I visited this central London canal junction on what turned out to be a rainy day. But having planned in advance a train journey I had to use the ticket. Disappointing in mid-August 2011! I was surprised how quiet the area was of boaters and general visitors. I suspect it is more crowded in 2017 but it is well controlled by the CRT. Click here to book a mooring. You need to pre-book to moor at the area. Click here to find out how. Click here to see CRT’s website coverage. The well attended annual IWA cavalcade is well covered by the media. Click here to view the IWA published details. Following the illustrative guide below is a gallery of the photos I took. 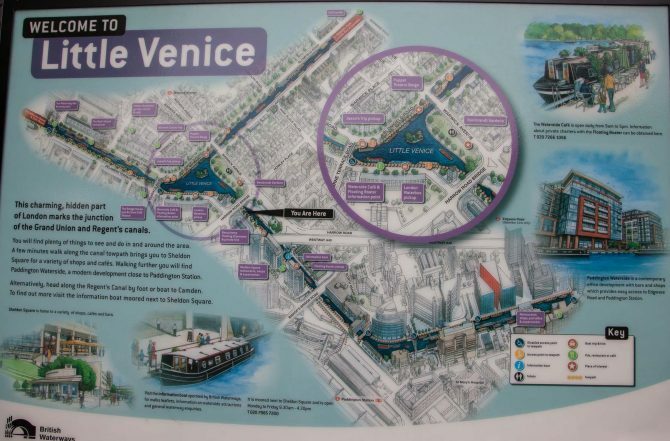 The photos are ordered from the approach to the Little Venice basin and onwards to Paddington Basin.